I love hosting parties- especially bridal and baby showers. One of my favourite parts, next to the decorations is the party games. I always try to come up with unique bridal shower games that won’t break the bank plus something that people will want to participate in (because not everyone wants to swing their hot dog at a mouse trap). This shower game will have your guests competing, all it takes is a bit of big screen knowledge. 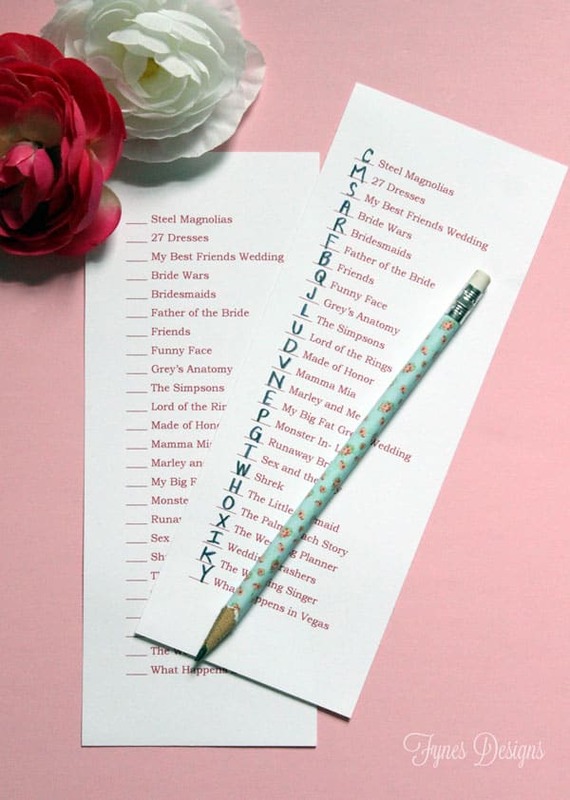 I love watching movies, especially those of the ‘chick flick’ variety, and nothing gets me more than a movie about a wedding, so I thought I would combine the two to create a fun bridal shower game. I like to call it Wedding Movie Matchup. First you will need to print the game card PDF I have created. There are 3 cards to a sheet, you’ll need one per guest. 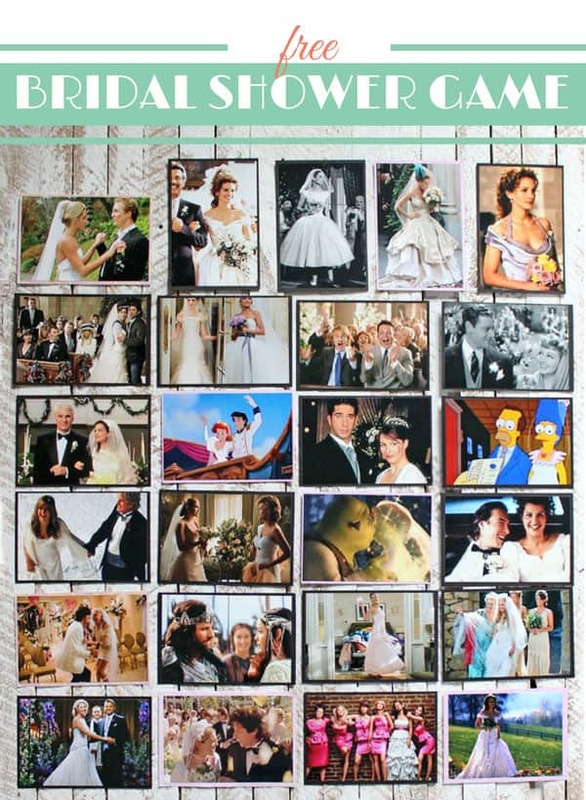 The game cards list 25 wedding themed movies or TV shows. Print a photo from each movie (links included at the bottom of the post). There are a mixture of movies/ shows so the game is appropriate for any generation. 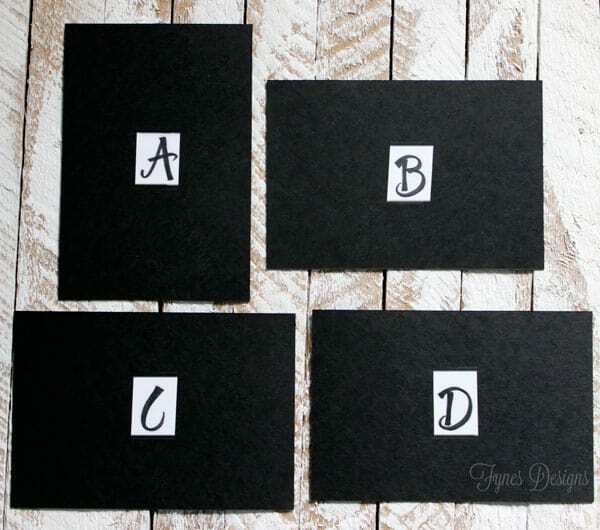 Mount each photo on a sheet of cardstock. Letter the photos from A-Y on the back side. (I used some old scrapbooking stickers). Each guest will need a pen and a game card. Sitting in a circle pass each photo around, the circle. Give the ladies approximately 30 second to look at the photo and write the letter on the back of the photo onto the game card to match the corresponding movie. Then pass the card onto the next person in the circle, making sure each guest sees all the photos. I threw in a few tricky movies to throw people off, surprisingly people had most trouble with the cartoon photos! After all the photos have circled around you can call off the correct order of the photos, or if you have extra time it is fun to hold the photo up and get people to call out the answer. The player with the most correct answers at the end of the game wins a prize. This game is so much fun, may the most watched win! I hope your guest enjoy it as much as mine did. Get the Baby Shower Movie Matchup game too! I remember playing this game at Candice’s shower. So much fun! This is such a great idea! 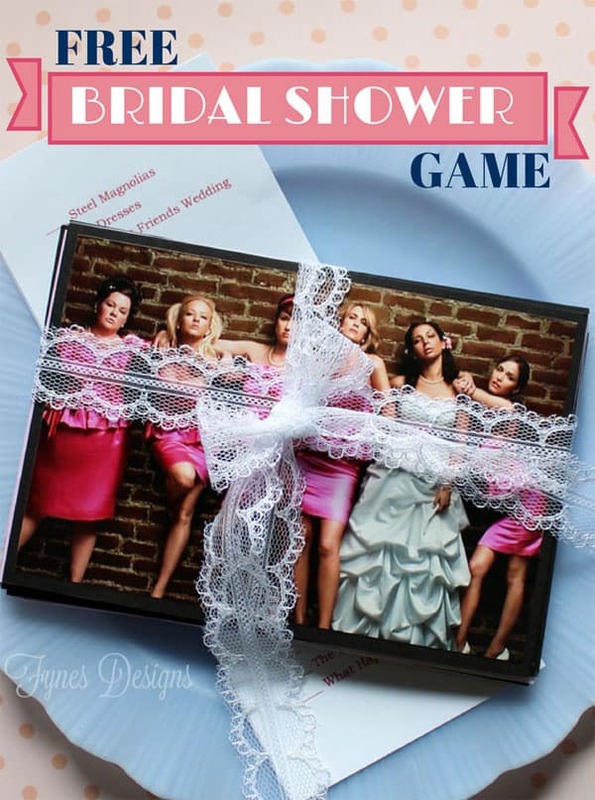 I wish my bridesmaids knew about this game about 2 months ago… I would love it if you linked this up to my Motivate Me Monday linky party. This is such a great idea. I love games like this! I am savings this for sure – thanks. Love this! I am prepping for my twin sister’s shower right now and this would be great! It’s an easy, unique, game! Thanks for making it and sharing it! Yayy, I’m so glad you like the idea! Have fun at your party! What an awesome game! Thanks for sharing it at our Motivational Monday party this week. What a great idea! I usually don’t like shower games, but this sounds so fun! Thanks! Most aren’t a big fan, this one doesn’t have you doing anything wild and crazy! So cute! How fun! Thanks for sharing with us at Your Designs This Time! Such a darling game! I am trying to print the pics, but they are too small when I save the image so the quality of the printed picture is awful. What am I doing wrong? I made this game a long time ago, so the links aren’t the original ones I used. If the quality is poor, i would just search the movie title again. sorry! this is so neat – you must have put a lot of time into it. thank you so much! Thanks for sharing your bridal game at #SmallVictoriesSundayLinkup ! Great ideas. Love the games. Pinned & sharing. Thanks for linkup with us @DearCreatives party! Hope to see you again soon. the link to the pictures isnt working:/ what did you search to get the wedding pic from each one?